I tried planting an avocado seed and sure enough has taken root in a pot. I'd like to try and bonsai it. Any ideas on how to go about it for this particular tree? Honestly avocado is no where near an ideal tree for bonsai the leaves are huge and if you don't live in a tropical region you will not even have a chance with it worse still starting from a seedling. If I were you I would just plant it out side and let it grow out as a regular tree. I can't seem to throw away or even compost avocado seeds -- and keep sprouting them and potting them up So to date, I have 6, possibly 7 avocado plants and 2 more, no 3 more seeds starting to grow roots and/or sprout. They're all being grown in standard dimension containers though. My plan is to keep increasing pot size until I deem it unwise to go any further, then root prune to keep them within bounds. It's true the leaves get pretty big -- as they mature, they seem to up their leaf size. The seedling that you just sprouted probably have 1"~3" leaves. My oldest -- maybe 5 or so years old -- has started growing 7"~8" leaves this spring. Coupled with the unpredictably long internodes, I really don't know how they'll respond to the usual bonsai treatment. I'm going to drastically prune one or two of them soon -- just before setting them outside. I'll have to cut off the early spring growth cluster of the largest leaves, so there might be something to report later on in the summer. Can I reduce the height of it or is that too late? It is nearly two foot high now and I would rather it was shorter. If I cut it down will it grow new shoots along the stem? I don't know and I'm not a bonsai grower. But I have tried starting avocados from seeds before and as I remember the trunks are slender and very smooth, don't have nodes where you would expect it to back bud to. Since your tree was free, if you don't mind risking losing it (you can always start another one), you can try the experiment, but I think there's a good chance it will just die. If you wanted to try it again after that, pinch the tip early on. Incidentally, you piqued my curiosity, so I googled avocado bonsai and found all the negatives (leaves too big, trunk too thin, doesn't back bud well) and not one single example of anyone saying they had successfully bonsai'd one. It's not too late to prune back your plant. I follow the "no more than 1/3, only 1/4 for weak growth rule" -- so if it's nearly 24", only cut 6" to a little less than 8" off the top, but don't expect "new shoots along the stem". Typically, avocado will grow out only ONE bud that will essentially take over the apical growth. What you CAN try -- look along the stem and see if you can spot a cluster of bumps (unformed buds) or a cluster of leaves or tiny leaves. They seem to occur every so often. If you cut just above those, *sometimes* more than one bud will be stimulated to grow. I just thought of this, so I don't know if it'll work. Now that I thought of it, I'm going to try it on one of mine You *could* try laying your plant on its side or tilting the pot at an angle. That might disrupt the apical dominance and promote multiple bud growth. I have also been experimenting with an avocado. I planted the pit in long fiber sphagnum moss last September. By January, it was about 18" tall. I pruned all but the top leaves, with a bunjin style in mind. I repotted in a small ceramic pot in 100% Turface MVP. I keep pruning the ginormous leaves every so often and also wired it to gain an interesting bend. Now that we are on the cusp of summer, I'll defoliate him, put him in a bit more sunlight and see if I can get the leaves to come back even smaller. I'll post before and after pics this weekend. Here is a pic of my little avocado bunjin bonsai project. Just pruned a couple of larger leaves this morning. I'm going to give it some fuller sun for a week or so to see if I can reduce leaf size at all. I posted latest photos of my older Avocados here. I have 4 or 5 seeds in various stages of growth elsewhere. Percy wrote: Can I reduce the height of it or is that too late? It is nearly two foot high now and I would rather it was shorter. If I cut it down will it grow new shoots along the stem? One of the most useful techniques in bonsai is to chop down larger material. That said, it is only helpful if the trunk is already the desired width. If something is only a sapling it will take many years to reach this width. If you keep it in a small pot and restrict its growth by pruning, it will take even longer. If you are serious about bonsai, set your avocado aside and let it grow. In the meantime, pick up some more mature 1 or 2 gallon nursery plants, then shape them. Not only will you get a fun project for a day, you will get instant gratification and practice in shaping, which will come in handy when your avocado is ready for training. But avocados are a very slender trunked tree (see "trunk too thin" in the list of why they aren't great bonsai subjects, above). So you could grow this out forever and it isn't really going to thicken up a whole lot. Avocados from what I understand are similar to caco trees in both leaf size and general growth. I have had success bonsaing caco trees to a degree, and therefore I'm thinking it is possible to bonsai an avocado. My only advice is be very gental with the roots. I've killed an avocado before by being careless with the roots during repotting, and exposing it to the elements shortly thereafter. I have an avocado tree about 7 inches tall. I thought I would do and Internet search to see if anyone was doing a bonsai of an avocado tree and came up here. I live in Virginia. USA and knew the winters here would kill my tree. I had to try starting several dozen avocado seeds in order to get this one tree and did not want to lose it. The only way I could think of to keep it was either build a massive green house or bonsai the tree. I thought I would join the forum in order to keep up with info and the progress of others attempting to do the same avocado bonsai. These avocado fruit are great in lowering Triglyceride levels. I lost 40 lbs in 6 months and my Triglyceride level went down from 405 to 49. All my Doctor can say is "WOW". He wanted to put me on blood thinners permanently and tried to tell me my high Triglyceride level was due to genetics. I knew that was a lie and dealt with the real root to the problem which in the processed food/junk food culture in America. I now eat only whole foods and fermented foods, no processed foods. I also eat lots of skinless chicken breast and fish. Avocados are a great between meal snack by themselves. 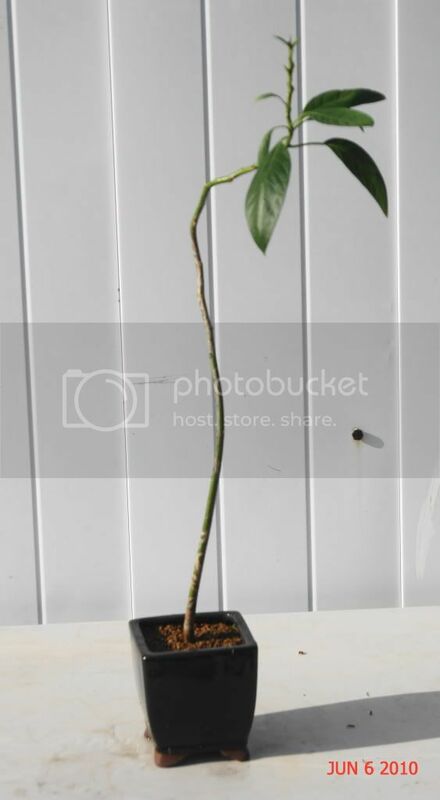 Would it be possible to take the new buds and growth from the top and graft them into the lower to middle of the trunk of the avocado tree? I decided to bring this thread around again. cdgarrett never got a response to his question. Most bonsai people would probably agree that avocado does not make good bonsai material. IF you live in the tropics, where this is a native tree, grafting could probably be done successfully with the tree in the ground. In a pot? Maybe if the trunk is large enough to take a graft, and if done in the correct season. I have never attempted this - no experience. Discussions of avocado would draw more enthusiasm over in the fruit growing forum - or maybe veggie - with a more diverse bank of members. However I did enjoy reading about your healthy eating habits. Avocado Tree as Indoor Bonsai?